Pinnipeds are the least popular kind of Sea Mammals and when they are called upon, they don't have much to tell. Nothing in fact. That's less than donkeys who at least insult people. 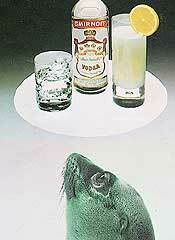 What most copywriters try to do is invoke some mild good feeling by placing the animal in a funny situation. Pinnipeds are in this respect very much the poor man's penguin and copywriters are obviously not at their best with them. 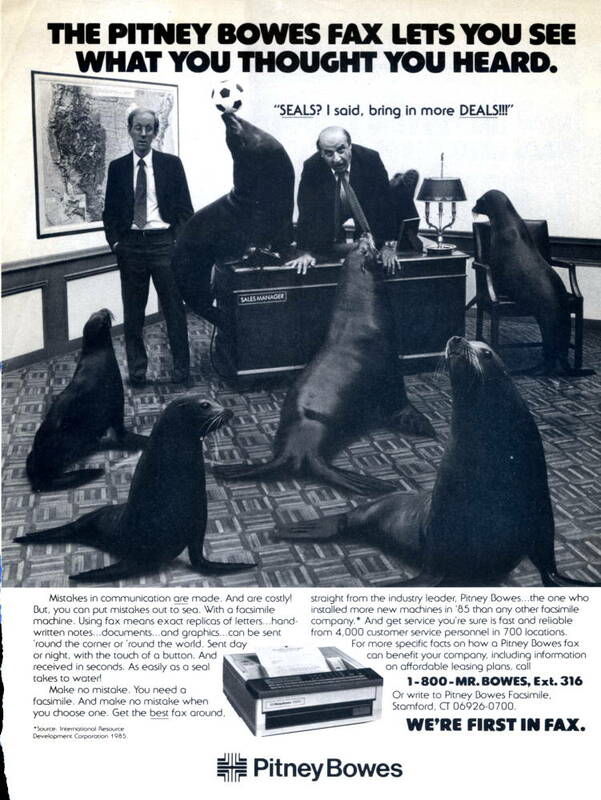 A desperate sales manager cries out SEALS? I said, bring in more DEALS!!! If he only had bought a facsimile machine . The year was 1987 and the accompanying text dutifully explains what it meant to use a fax. Notice also the predictable wordplay. Mistakes in communication are made. And are costly! But, you can put mistakes out to sea. With a facsimile machine. Using fax means exact replicas of letters ... handwritten notes ... documents ... and graphics ... can be sent 'round the corner or 'round the world. Sent day or night, with the touch of a button. And received in seconds. As easily as a seal takes to water! (1) 1987 - Seals? I said, bring in more DEALS!!! 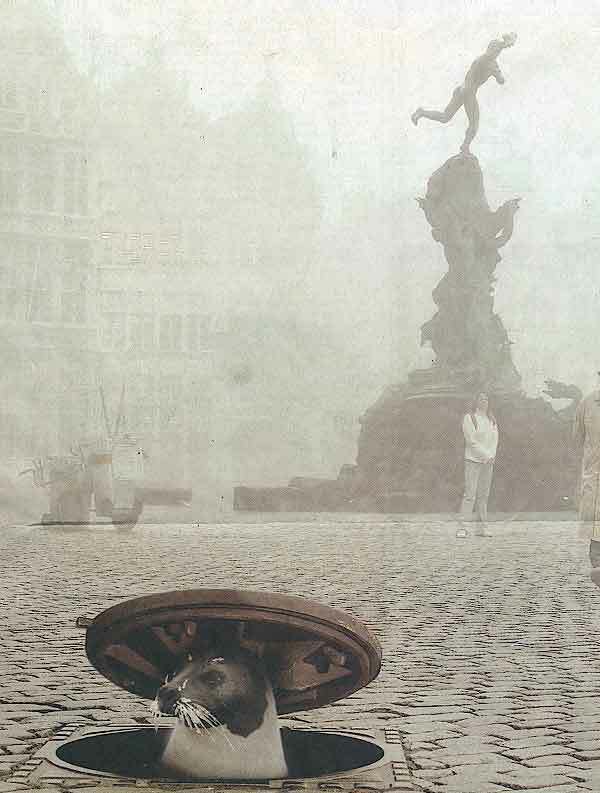 (2) 2005 - You're in Antwerp before you know. 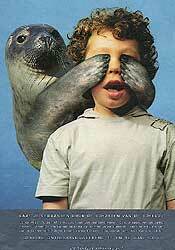 It is indeed one of the better uses of pinnipeds. The mistake could happen in a sales environment and if you are determined to make an advert with animals it's probably difficult to find other credible animal-mistake pairs. 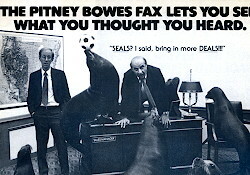 Another brand of faxes takes a different approach with an elephant (see Elephants). The elephant stands for the huge amount of data you can fax over the ocean, in a blink of the eye! The second advertisement is ambigous in its meaning as an announcement of the traffic Master Plan of the city of Antwerp (2). The copy is clear enough. It says that the Plan and the roadworks will make of Antwerp a city with safe traffic, nice to live in and easily reached. That last point is underscored with the caption You'll be in Antwerp before you know it. So far so good. What disturbs me is the species. A Harp Seal in my opinion, is not indigenous in the region. Harp Seal is an Arctic species and at the time of writing only three recent sightings at the Belgian coast are recorded (2003 and 2006). Are we looking at an individual come to Antwerp by purpose (Well done, Plan!) or has the poor animal lost the way (Mislead by the Plan)? 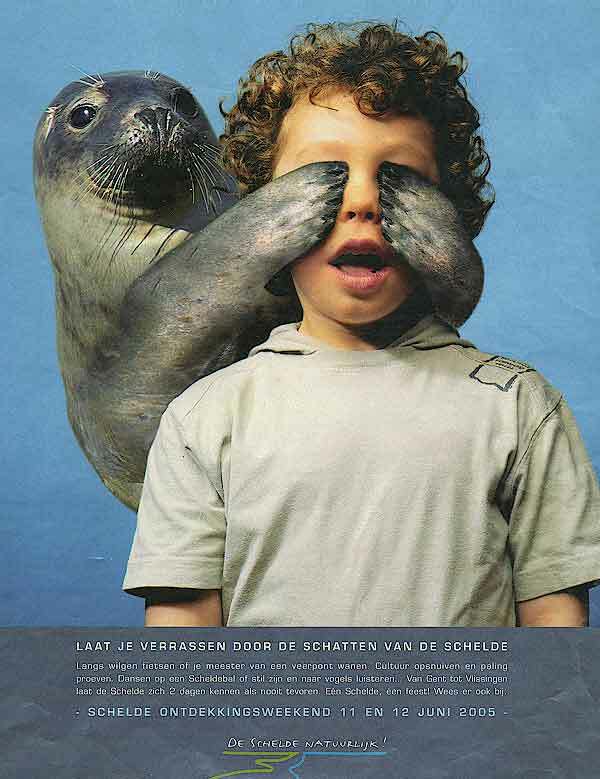 (3) 2005 - Let the river Scheldt surprise you. River Scheldt is gradually becoming healthier and one of the more visible effects is the renewed presence of seals. It's no surprise that a celebration day is announced with a seal offering a thrill and a chuckle. 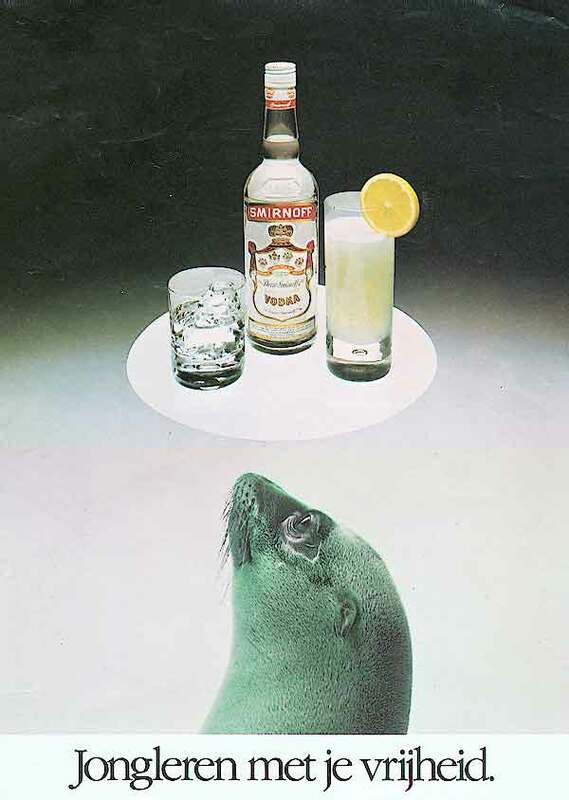 We've seen the same vodka brand (4) also with penguins (see Penguin ad 24) and several other animals and we are not looking at the best of the series. The caption is weird, perhaps even wrong. It says Juggle with your freedom . The picture shows two different drinks and is therefore an illustration of a choice: thus giving us freedom of choice. I wouldn't juggle with my freedom (not even of choice), but I will gladly use it. The image work isn't any better than the caption. It was probably considered too much effort to take a real plate when most image software gives a nice ellipse in a click or two. Afterthought: playing with two options, do you call that juggling? Advertisement 5 is located in London. We have a room with a view on the St Mary Axe tower. 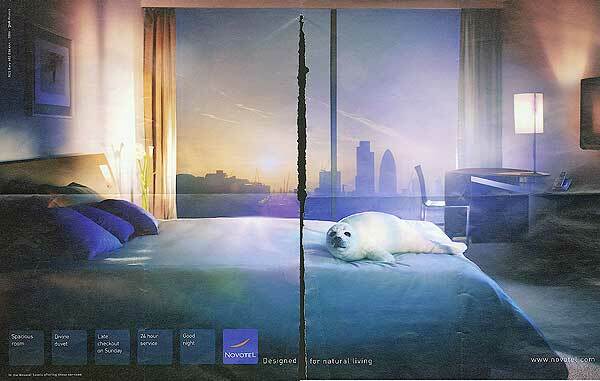 The situation inside is less enjoyable because there is a seal on the bed. 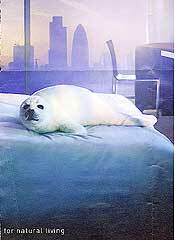 The seal - or is it the room? -, is Designed for natural living . Clueless I am, really. I assure you. The situation reminds me of the Polar bear and the window (see Bears ad 25) where the bear stands for nature without any real connection, which I could perceive, with the product. That's entirely wrong of course. A fax lets you see what you should have heard.